Why? You didn't do anything but help. Because instead of using a wire bail or other gadget to secure that relay, the engineers did what they did. Cost less, and lasted for the design lifetime, but makes a mess out of repair. My guess would be they did not like that they had to do it that way. I'm more upset that it failed @ 93,000 miles, and wasn't designed to throw a code beforehand. I got a code for an 02 sensor failure and a warning light for low windshield washer fluid, neither of which will leave me stranded. That's insane. It represents the politics of privilege. Driving is a privilege, and thus subject to political control in the form of licensure and regulation. Well at least I've gotten two more years out of it, but I bet I've driven it less than twenty times. Same symptoms as before, except this time jumping C1 to A2 on the starter relay does nothing, so I assume the starter relay is still good. I put in a new Optima battery a few days ago. I have no error codes, and the fuses are good. I pulled on the SC belt to make sure the starter wasn't jammed. With the ignition in the "run" position, the SES light is on and there's a red light in the temp guage. With the ignition in the "start" position, there's a "click," the anti-lock light comes on and the traction control light temporarily comes on. That's all I've done for now, I haven't tried jumping the starter yet. Who wants to guess what the problem will be this time? The new battery reads 12.27 volts with the cables connected and 12.49 with them disconnected. Somebody tell me what settings to use on the DVM to probe the other stuff on the car, like the starter relay for instance. Sounds like a ton of fun. The SES light will always be on in the "RUN" position without the car running. Once you start it, it goes out (given there isn't a problem). As for the other lights coming when you try to start it, they shouldn't be there. Put the meter on the same setting you used for the battery (voltage). Ground the negative to frame, or bolt, or transmission. If memory serves me right, there's a ground stud on the trans near the starter. 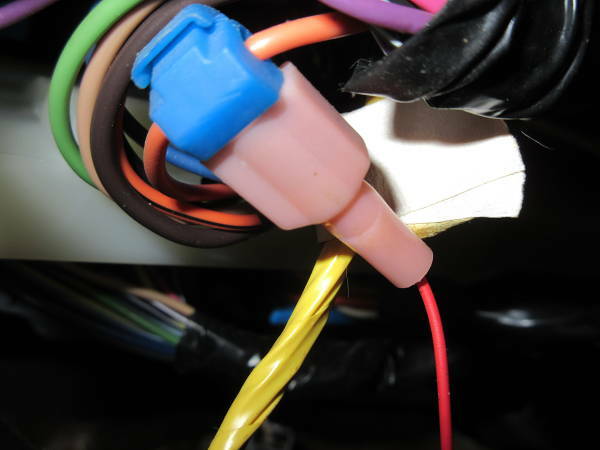 Put the positive lead on the small terminal of the starter solenoid (it's either a purple or yellow wire going to it). Have somebody try and crank the car. If you've got 12V at that wire and the car doesn't start, the starter is bad. 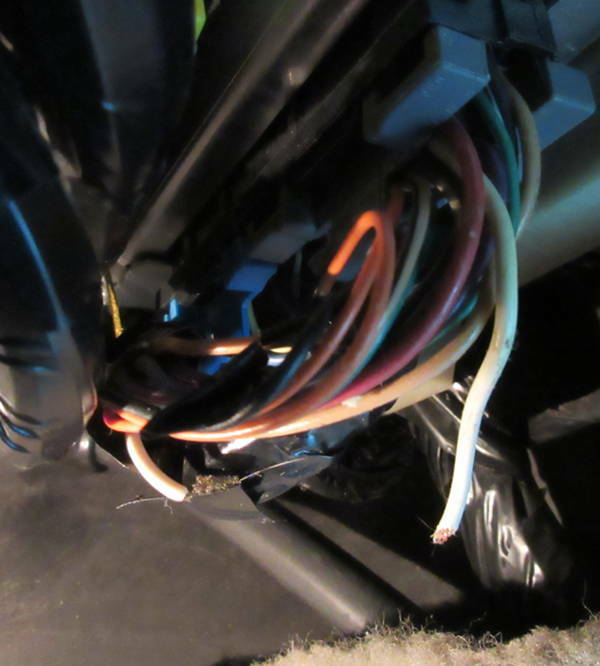 If you DON'T end up with 12V, or any voltage, you have a wiring problem that we need to chase. I got nothing on the purple wire. Is there any other test to confirm it's the starter motor? I remember jumping it, but I can't remember what I did. If the problem is the starter, which replacement do you like? Nothing at the purple wire? That wire is only hot while trying to crank, not in RUN. 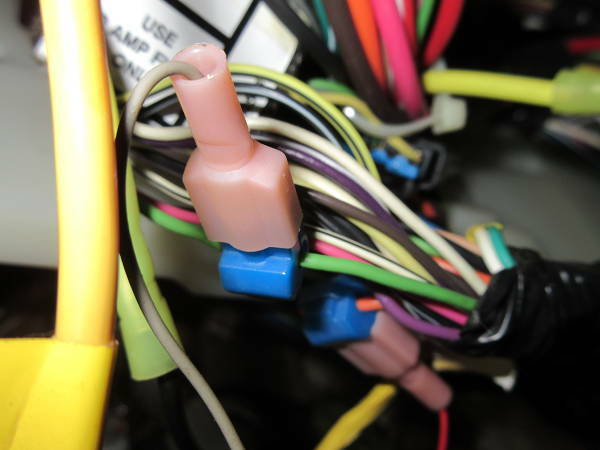 If that's the case, it puts you back at the relay.....or that little wire is corroded/broken somewhere between the starter and the fuse block. As for the other lights coming when you try to start it, they shouldn't be there. BTW maybe I should mention that the previous owner had this thing called a "Safelok" installed. I don't know what it wires into, but it basically gives you a second key that the car won't start without (I assume, I haven't tried starting the Riv without the Safelok key plugged in). Nothing while trying to crank, with the key in the start position. 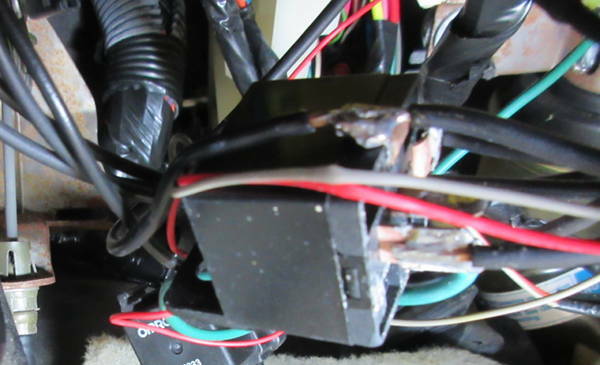 If you jump between the main battery connection on the solenoid to the solenoid terminal (purple wire), the starter should crank the engine. If you do that with the ignition key in the run position, the engine should start if everything else is good. I used to do it with a flat bladed screwdriver, just sparks a bit. Well now. I wonder wonder wonder if that "Safelok" thing might be screwing up finally. I find it hard to believe that you'd have a recurring issue like this. Aside from a corroded wire here or there, these cars usually don't have this problem. I'd be back at the relay terminals testing voltage again (page1) if there's nothing on the purple wire. That's the circuit that a lot of aftermarket "theft deterrent" systems attach to. Bridge the positive and negative connections on the starter solenoid? It's a possibility, and I'll probe the relay again. Replacing the starter relay solved the problem the last time though, and there were a couple times where I let the security system run the battery down before I figured out what a booger it is. So I don't think the Safelok has caused a problem so far, but it could be now. I also need to check under the passenger kickpanel where I tried to disable >something< under there, many years ago, thinking it was the source of a non-start problem. Maybe I've got a wire loose. No. 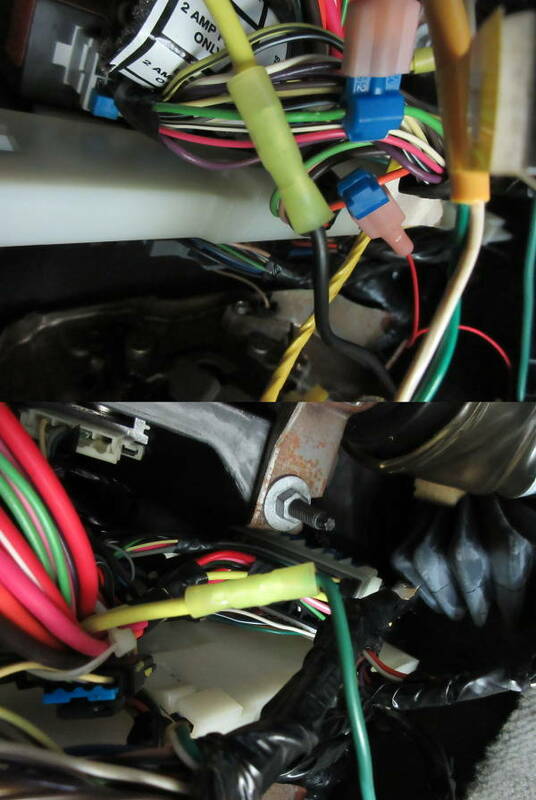 If you jump the big positive battery cable to the small purple wire, the starter should turn over. There is no ground wire on the starter. It uses the block as a ground. That's how the starter works. It always has constant B+. That little purple wire is the CRANK feed from the ignition cylinder. Today I went out to run more tests, and just for fun decided to try starting it again, and it started. Then I tried again, and it didn't start. Then I pulled the key from the anti-theft system, and put in the other key, and it started. Then I put the first key back in, and it started. It started a few times after that too, and it started really well. So ATM it's starting again. 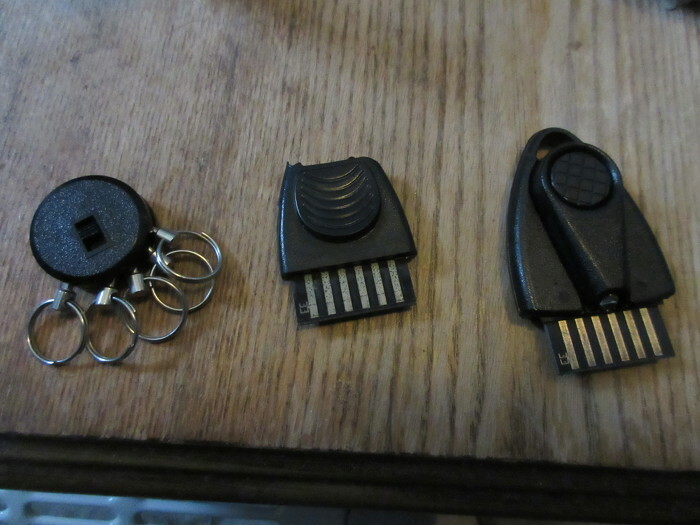 On the far left we have a key fob, which has a switch on it. The switch appears to do nothing. In the middle is the key that's normally in the car. On the far right is a second key. It has a button on it, and an LED. I can't guess what the button does. Ok, I hate these things. As you can see, my situation is just full of win. I'm in the process of figuring out what I messed with in the passenger foot well a few years ago, the first time I had a no-start issue. I know I cut a wire and spliced it back together later, maybe that's working loose. Abaddon may be right about the Safelok aging out though, and I guess that means my 94,000 mile Riv is somewhere between permanently unreliable and bricked. Here's the wire I cut under the glove box, apparently I never bothered to splice it back together because the car runs like this. I suppose that rules out the possibility that the cut wire was causing my no-start, because it starts great with the wire cut. So now we're back to the Safelok, or something else entirely. There's also a few wires that tap into the Riv's ignition system. 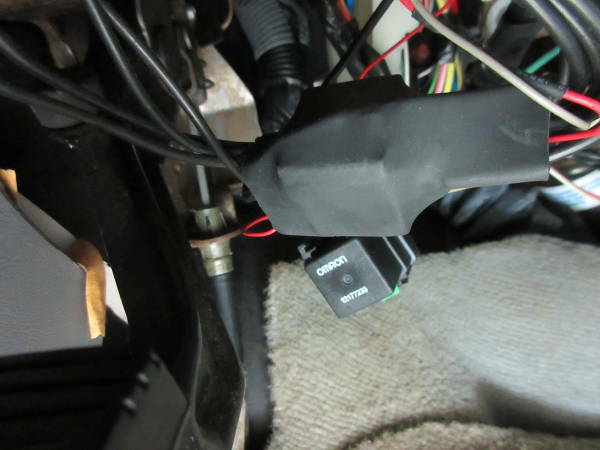 In this first pic, a yellow wire on the Riv has been cut and tapped with green and black wires to the safelok. There's also a red Safelok wire that taps into an orange Riv wire, with a connector type I haven't seen before. What's going on under the blue bit? 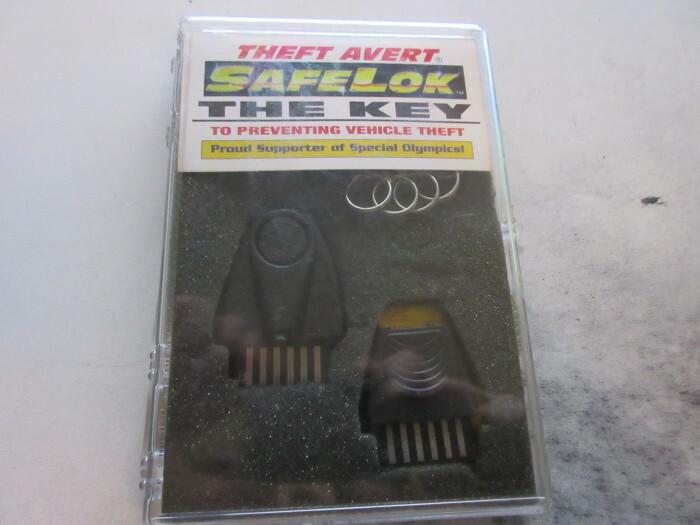 It doesn't look like it would be very hard to remove the Safelok. Am I missing something? That big "bundle" in the 2nd pic. Is that a relay underneath the shrink tube? It's the starter relay we replaced a couple years ago. I pulled it down to test it and haven't put it back yet, in case we need to do more testing. The Yellow wire that's cut. It appears that they've bypassed either the PNP switch, or the START input from the Ignition Switch (makes more sense). That would give control to the SafeLok to energize the relay. The Orange wire is nothing more than B+ voltage. That's why it's tapped and not cut.....it powers other things. I'm trying to find what the green wire is. Sounds like this could be as simple as soldering the yellow wire back together. 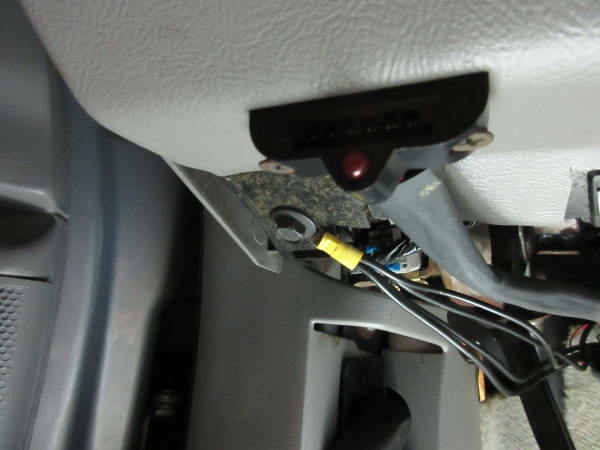 Looking at the pics again though, I wonder if that is some kind of shrink wrap over a connector, and maybe if the safelok was unplugged, the connectors on the yellow wire would plug in to each other? But it might be better to cut them off and solder the yellow wire together. That big shrink wrapped bundle appears to be another relay. That's what I was asking about. I'll bet that they wired in its own relay, and just needed the START wire? I'd cut that shrink wrap open and have a look around. You mean I've got TWO starter relays? What's the angriest emoticon on this board? I'll cut the shrink wrap open and get pics. Any thoughts on the white wire under the glovebox? Here's the mystery hiding under the shrink wrap. Looks like a relay to me, with some crudely done soldering. It's a wonder this car ever started. If this was the problem, than both relays died within a thousand miles of each other. Am I the only one on the board who's had to replace the starter relay? I'm wondering if I'm seeing something normal, or the symptom of another problem.